What would you do with $9000? Maybe you’d buy a car or finally go on that amazing holiday you’d always dreamed of. If you’re a computing professional you may just blow it all on an Intel Xeon CPU. I know it sounds crazy, but it’s entirely possible to spend that amount of money on a single CPU. Specifically the E7-8894 v4, a monstrous server and workstation chip that we mere mortals will only ever read about. So let’s check out what exactly is going on under the hood of this poster-worthy processing paragon. 1 It Costs How Much? Before I get bashed over the head for exaggerating the number, it is true that the chip does not actually cost $9000. It’s exact MSRP is $8898. Close enough, though, right? If you’ve never heard of or looked at an Intel Xeon CPU, this number is especially shocking. For those of us who keep track of high-end hardware releases, it’s not that crazy. However, even for a top-end Intel Xeon CPU, nearly 9K is an audacious amount of money. Before we get into the technical details of this particular chip, let’s quickly go over what makes an Intel Xeon CPU different from a run-of-the-mill processor the rest of us would buy. Xeon processors are geared to be used in workstations and servers, which means that they have different design priorities to something like an Intel Core i7. Most of the time the actual processor silicon is not all that different from regular processors. In fact, Xeon processors are often a step behind in microarchitecture. However, they do some things no other Intel CPU does. Xeon processors support a type of RAM called “ECC” memory. That’s short for error-correcting code memory. This memory can detect the common forms of data corruption and fix them on the fly. This helps to prevent crashes and minor calculation errors. Things that aren’t too much of an issue for the average users, but can cripple a mission critical application. You want your workstation or server to stay up and running for as long as possible, so paying the premium for stability and accuracy is worth it. While modern CPUs have a ton of cores, sometimes you need to go beyond that. Xeon CPUs can run on motherboards with multiple sockets, so you can combine more than one CPU of the same model. Although the idea of four $9000 CPUs in one computer is pretty ludicrous, there are customers out there who need it. Speaking of cores, Xeon processors tend to have a whole lot of them. While Intel has seen fit not to go beyond four cores in its current Core CPUs, Xeon CPUs can feature much more. This is also the reason they have so much more cache than regular CPUs too, in order to keep those many cores fed. Xeons are also hyperthreaded, just like Core i7 CPUs, which means you get twice the number of threads as physical cores. 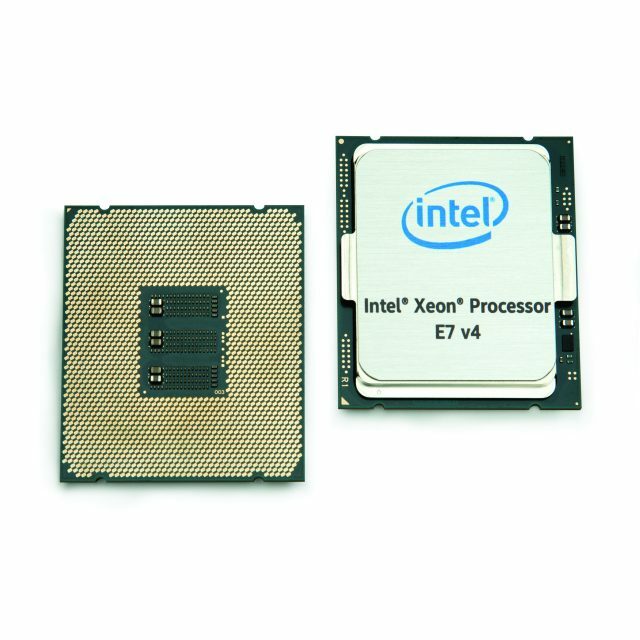 Xeons represent Intel’s best mix of performance, accuracy, and stability. They don’t represent the best in outright per-core performance. You’re not going to overclock a Xeon and you aren’t going to get the best gaming performance from one either. These are multi-thread monsters, but not outright performance machines. So even if you had 9K to blow on a CPU, you wouldn’t do it for those purposes. So what does the new uber-expensive Xeon offer a prospective buyer? First of all, it has a whopping 24-cores. That’s 48 cores per CPU, which is a lot of threads. They run at 2.4 Ghz, but can turbo up to 3.4Ghz if many cores are idle. Since Xeons can be used in multi-socket systems you can combine between four and eight Xeon 8894s on one motherboard. That’s as many as 192 cores and 384 threads. Pure insanity, but great for datacenters. The maximum amount of RAM that this Intel Xeon CPU can handle is a whopping 3 terabytes. In a world where most desktop PCs run just fine with 8GB of memory that really puts things in perspective. The CPU’s memory controller supports a maximum bandwidth of 85 GB (that’s gigabytes) per second, spread across four memory channels. This Intel Xeon CPU has a whopping 60MB of cache, which is about as much RAM as Pentium Pro servers had 20 years ago. Although the 8894 does not have an onboard graphics chip, as is the case with most Xeons, it has a very healthy 32 lanes of PCI 3.0 bandwidth available. It may not be meant for gaming, but lots of professional applications make use of GPU processors for other reasons. Having enough PCI lanes is crucial in those cases. This new Intel Xeon CPU represents the rarified air of high-end technology most of us will only ever read about. Just reading about it is already enough to make me feel light-headed. Even though most of us don’t get to play around with Xeons on a daily basis, they do give us a glimpse of what regular CPUs may look like in the coming years. After all, just a short while ago quad and eight core chips were also reserved just for servers and workstations. Now with the arrival of Ryzen on the desktop, don’t be surprised if i7 or even i5 CPUs start adding more to the menu. Even though we may not be buying them for ourselves, these $9K CPUs actually do benefit the everyday Joe. After all, the next time you visit your favorite website or stream video, it’s quite possible that a Xeon just like this one is doing all the work at the backend, making advanced applications on the internet possible. But now it’s back to reality and what’s running in our actual desktops. So, should you upgrade your CPU? Maybe you still feel like reading about unattainable hardware? Well, why not check out the latest toy from Nvidia?